Have you ever been to Chicago? Do you know what a Chicago-style Italian beef sandwich is? Even if you've never had one, you might have heard of them if you ever watch food shows that travel the country and sample local cuisine. When those shows go to Chicago and they're not eating fancy food, you can just about bet they'll sample a hot dog, pizza, and Italian beef sandwiches. I grew up thinking those beef sandwiches were no big deal - that they were as common as grilled cheese. Yeah, right. They're that common in Chicago. Not so much in Colorado. Italian beef wasn't on my mind when I started this dinner. You see, I recently got a pressure cooker for testing and I went to the store looking for something to pressure-cook. My first thought was corned beef. I'd seen them about a week before - at some store - but the store I chose that day didn't have any corned beef. i love cooking corned beef in a pressure cooker. It's never dry and always tender. I knew it would be a good test. And it would make great sandwiches. But no luck. I looked for beef short ribs. Nope. Oxtails? Ha! Not a chance. What else? I wandered up and down the meat section. Steaks, roasts, babyback ribs ... all relatively tender or meant for smoking or grilling. I found a pot roast but it was huge. I didn't want to feed the whole neighborhood. And then I saw the brisket. It was a small-ish hunk, not a whole brisket. Enough for a couple meals. But what could I make? My first thought was brisket tacos. I mean, why not? But as I was putting the brisket into the pressure cooker, I decided to tone down the flavors a little bit - no overt hot pepper. I settled on using oregano and garlic, thinking that it would work for several cuisines. 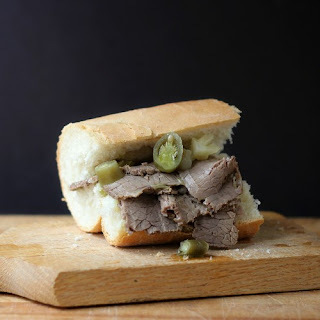 But when I tasted it, I knew I had to do a play on Italian Beef sandwiches. Brisket isn't what's normally used, and you can tell the difference. But I really, really, really liked it. Heat the oil in your pressure cooker, salt and pepper the brisket on both sides, and brown the brisket on both sides. Add the garlic, oregano, and white wine. If you don't have wine, water will do. Or you can use beef stock. Add enough water so the brisket is almost covered, but the top of it is just peeking out above the liquid. Clamp the lid on according to the manufacturer's directions. Bring the pressure cooker up to pressure (the one I was testing didn't have options. Go for high. Everyone always uses high, anyway.) And cook for 55 minutes. Let the pressure reduce naturally, until you can take the lid off. The meat should be fork tender. You can serve the meat right away (and we did have some that night) but the texture of the meat will be better if you refrigerate it - in its juices - until it's fully chilled. Or, overnight. Until dinner the next day. Whatever works. It's also a heck of a lot easier to slice it thinly when it's cold. Slice thin and heat it gently in the juice. Serve on French bread with a lot of the juice. 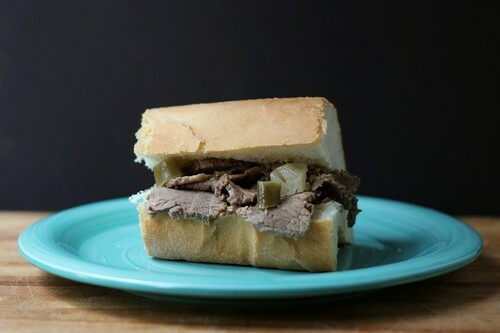 Yes, a real Chicago-style Italian beef is kind of soggy and messy. Hot giardiniera are pretty commonly served on beef sandwiches in Chicago. Or you can go for the "sweet and hot" which include both bell peppers (cooked) and the hot giardiniera. The two brands of authentic hot giardinera I can find here, in specialty shops, are Marconi and Vienna. Either one are good. I'm working on a recipe of my own, but I'm not quite there yet. 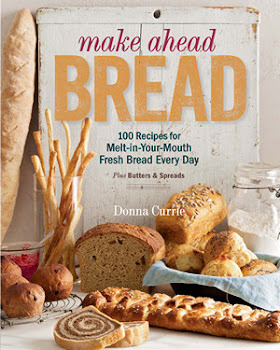 Bread, on the other hand ... well, you know I made THAT, right?